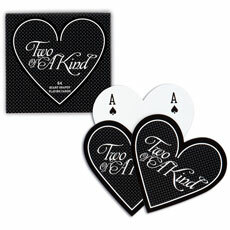 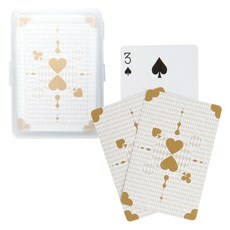 A popular take home gift for card players of all ages who like to play games from Go Fish and Bridge to Poker. 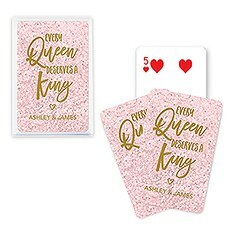 When you add our customizable playing cards into the party favor mix, we can guarantee that none of your guests will complain about getting a bad hand! 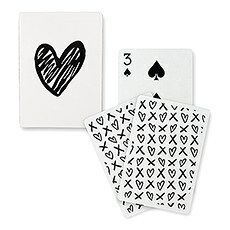 Our playing cards will make a fun take home gift that everyone will love. 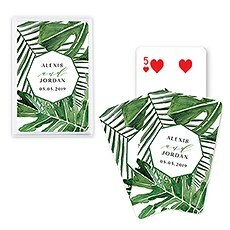 Whether your wedding or event is casino, Vegas themed or is simply packed full of game-loving family and friends, everyone from your youngest to oldest guests is guaranteed to appreciate this thoughtful favor. 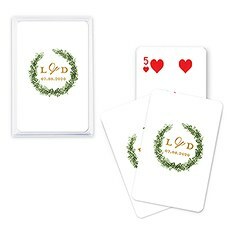 Our playing cards will ensure that your friends and family leave your party with a few, good-natured tricks up their sleeves!Our quality playing cards are an affordable, fun option and will add a playful touch to each table top place setting! Add your own labels (sold separately) or check out the personalized selections - add your personalized stamp to each card to remind your friends and family of the smashing success your party was! 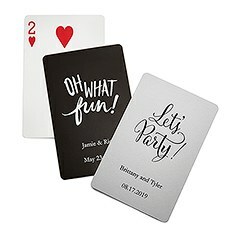 Our cards can be customized from their color to their sayings and their foil prints. 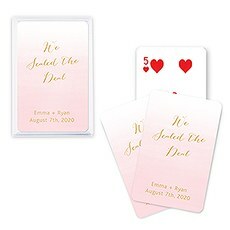 Choose from logos and themes that range from wedding and engagements to fun sentiments, such as "Ooh la la," "Let's party," and "Hugs, kisses and merry wishes!" 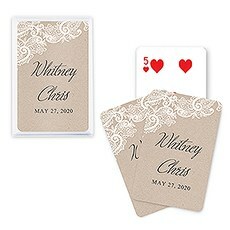 There is even a boot logo available for your western-themed party or wedding! 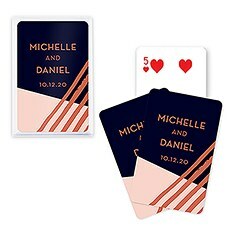 Browse our endless options, play and create your own to make sure the designs you choose are perfect!Or choose from our other designs that offer something for every die-hard card shark. 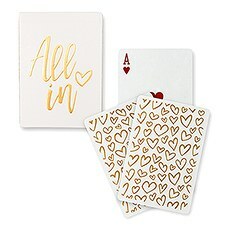 Our gold foil "All in" cards with its romantically modern heart design adds a special touch to your favor giving sentiments. 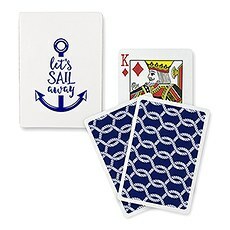 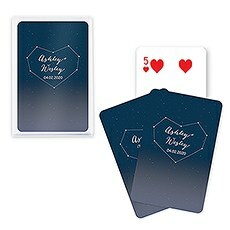 Our heart-shaped playing cards are a perfect addition to your wedding-customize the colors and logos to make them even more personal.The black foil modern hearts add a contemporary touch to your place settings, and our navy foil "Let's Sail Away" cards will be a perfect complement to a nautical, beach or water-themed party. 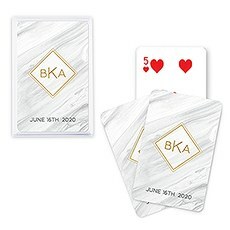 Browse our cards to find the best option. 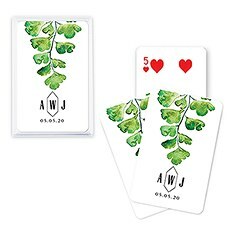 Don't forget to check out our ideas and inspirations -we've got fantastic inspo for mixing and matching our party favors to create spectacularly themed parties that will leave your guests in a festive mood long after they have gone home.The more you buy, the more affordable our playing cards are - check out our bulk pricing! 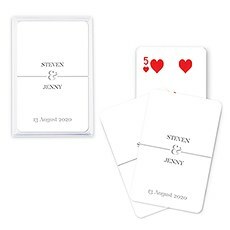 A great time will be in the cards when you choose our entertaining playing card favors for your wedding reception or party!